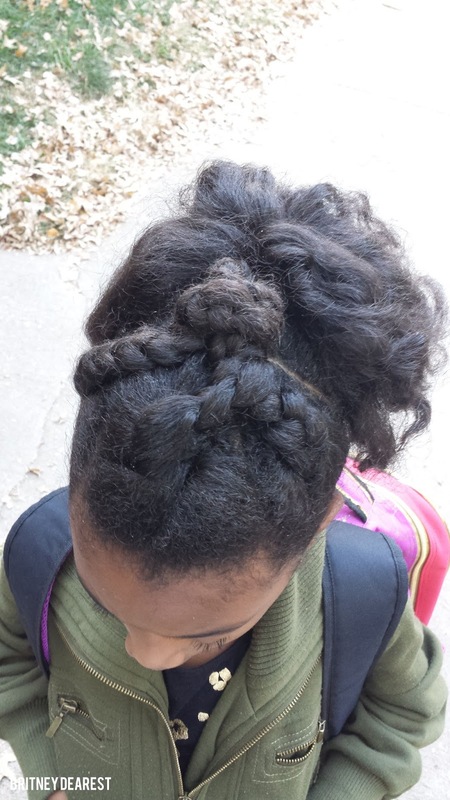 Contrary to the myth, not all Black women are able to french braid or cornroll! Although I had been trying to learn ever since I was a little girl, I could never get it right! 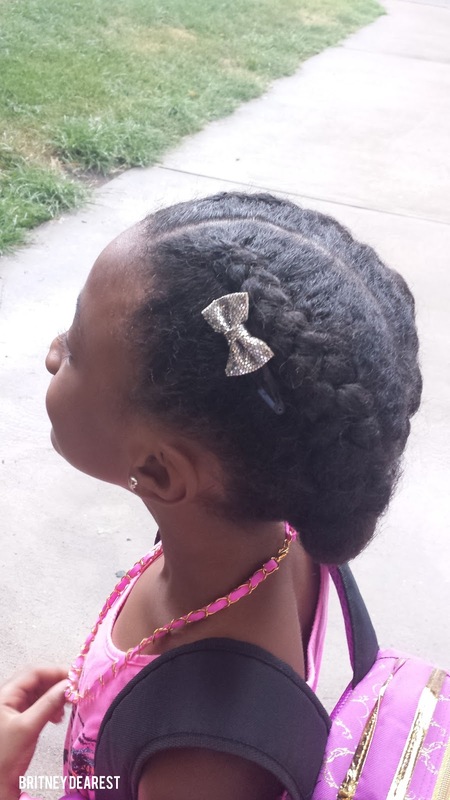 It was only a few years ago that I successfully french braided my daughter's hair and I know of multiple other Black women who have admitted that they couldn't cornrow to save their lives! 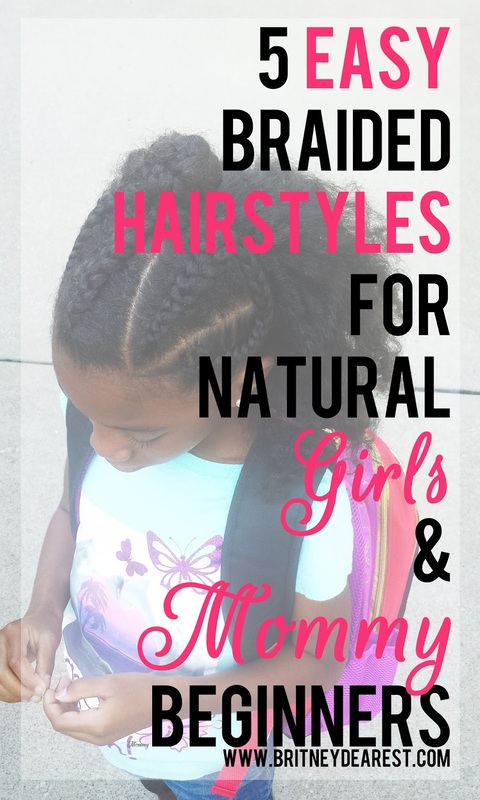 I was determined to teach myself to braid better because honestly, I can't afford to pay $50+ for a hairstyle every other week and I would rather my extra money be spent on home decor, family activities, and food I don't want to cook (like some good BBQ!). 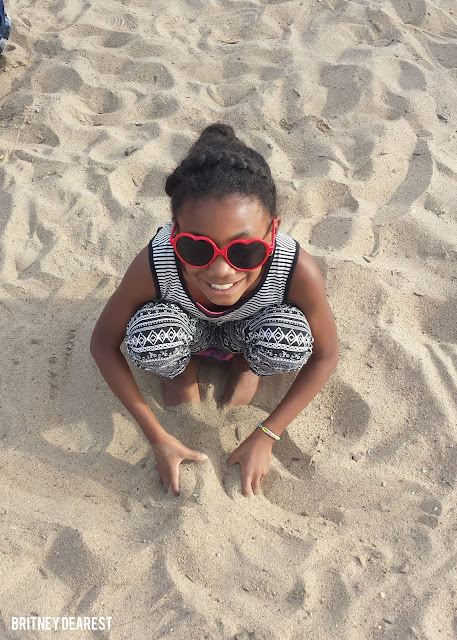 This year, I vowed to take better care of my daughter's hair. Last year, it stayed in a top bun. All. The. Time. I washed her hair about once a month (she has a lot of hair!) and it has broken off a lot. I gave myself a pep talk and promised my daughter I would do better from here on out. One of the techniques I have incorporated for healthy hair growth is protective styling with braids. So far, so good! I don't like to do hair often, so I opt for styles that are easy and can last a few days to a week. I could probably do an elaborate style with a lot of tiny braids but it would take longer than I would like so I prefer thicker braids. 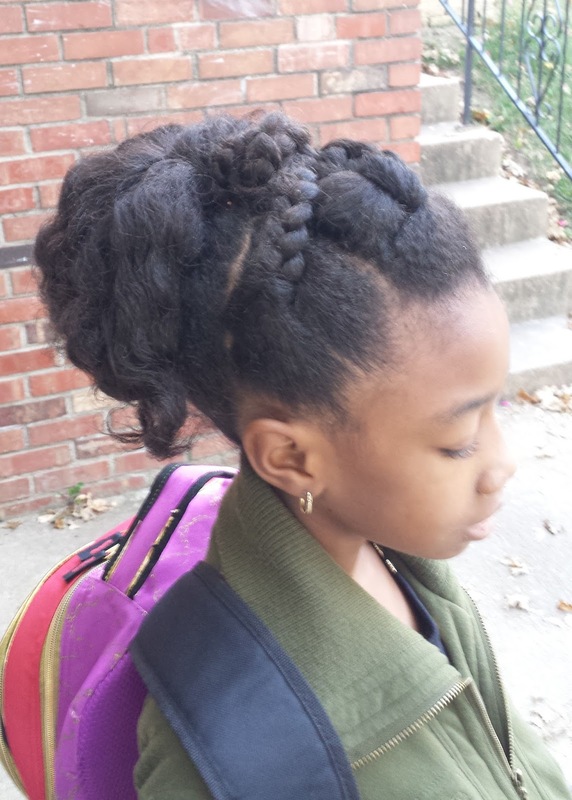 With this style, her hair was previously blown out a couple weeks ago. 1. I parted three large sections at the top and made three individual braids. 2. Pinned them into a bun. 4. I put 4 thick twists in back and made them into Bantu knots. 5. I took them down in the morning and pulled them up into a ponytail, leaving the top in a bun. 1. I parted out hair in the front for a braid to go across the front and temporarily pinned it up to keep it out of my way. 2. 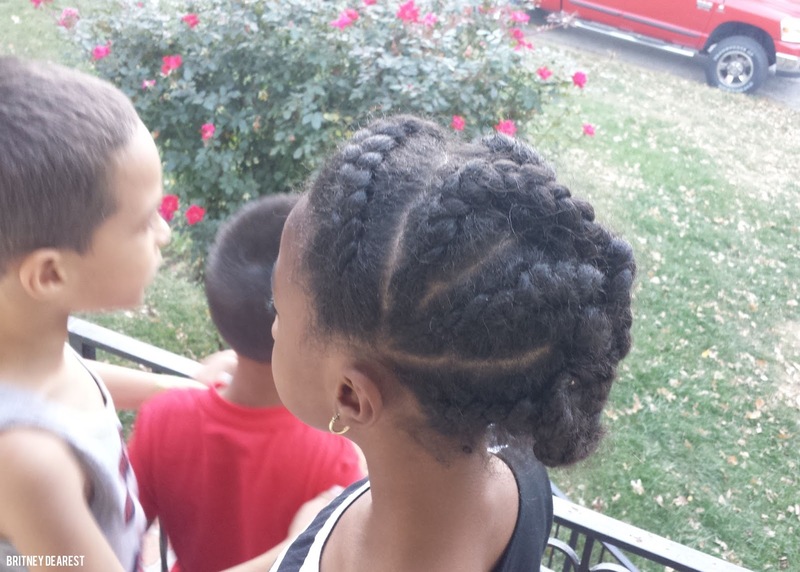 I started the back as if I was braiding her hair into a mohawk and parted down the middle. 3. I parted and braided as I went; making 3 braids on each side. 4. 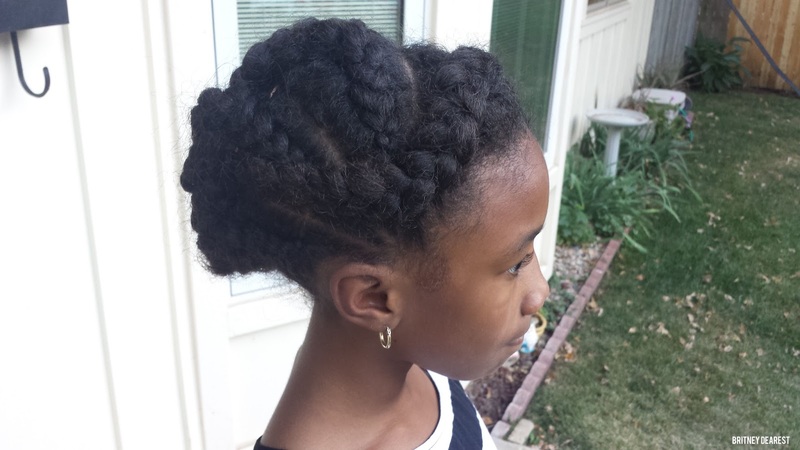 I crossed the braids together going down the middle and made a little bun near her nape area. 5. I braided the section in the front and pinned it back into the other braids. These are actually two different styles, but they could be combed. 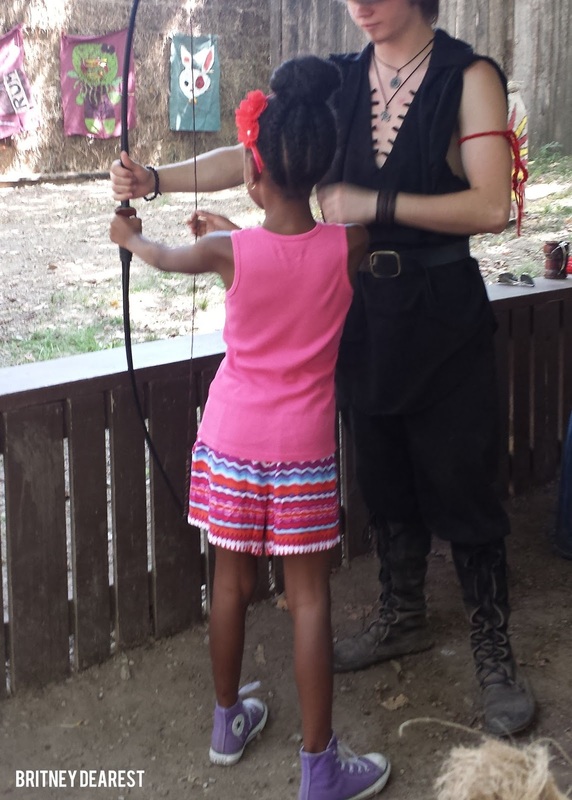 Above, the rest of her hair wasn't braided, it was pulled back into a bun. Below, the back is braided up, but I was too lazy to finish the top of her hair and she was tired of sitting. 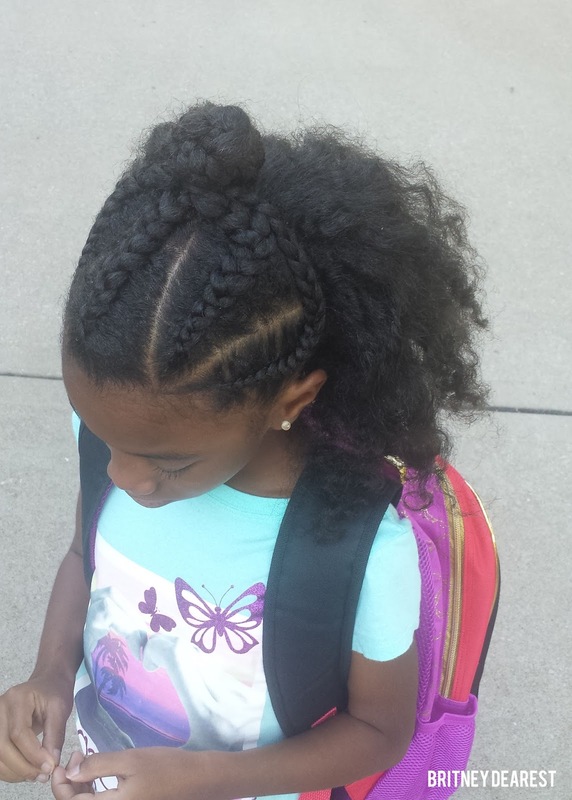 I could have just made a big braid going across her head like the one in the photo above. 1. I sectioned off the back of the hair and kept it out of my way with a big hair clip. 2. 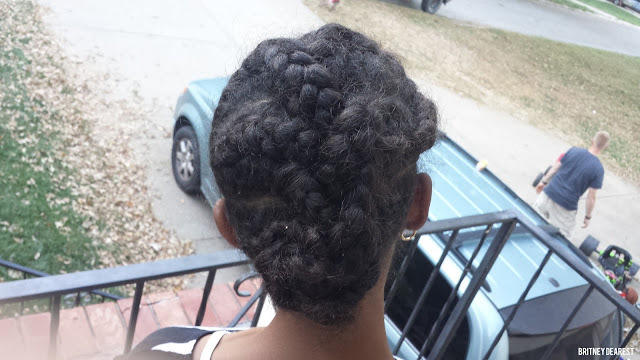 I parted and braided the top and put it in a bun. 3. I twisted and knotted the back. 4. Took the knots and twists down the following morning for a 'twistout'. 2 braids. Her part in the front begins about 1.5-2 inches over from the middle and curves into the middle. You don't have to braid perfectly, I sure don't, as you can see. I do what I can and make it work. No lol! I have wore 3 out of the 5. I can't braid the back of my hair very well and my forehead is too big to wear a braid over the front of my head. You did a great job, Britney. My braiding is not great at all, so I don't know if I can do all of them. But I am going to attempt. Thanks for sharing! Thank you Dre! Practice makes you better :-) Thanks for stopping by! I need a deal like that! I can can completely relate! The top bun is usually my go-to style for my daughter, but I'm trying to do better lol. Your daughter's hair is gorgeous! I love these styles! 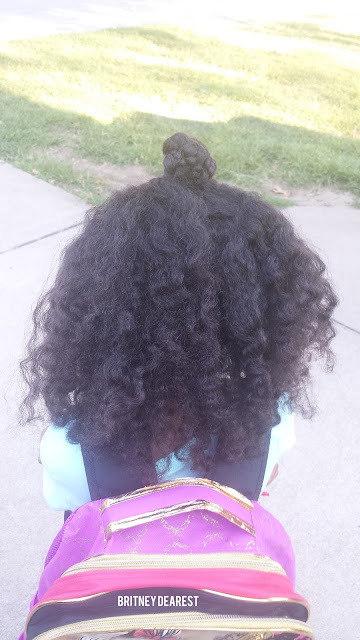 I'm always looking for inspiration for my two curly girls' hair. That is very interesting. The color looks good too. I wish to get beatiful hairstyles. Further info tovisit here and get awesome hairstyles and hair color ideas. Hairstyles for Round Faces have been in fashion in one form or another for decades If you think that Hairstyles for Round Faces do not give a vast variety of options.